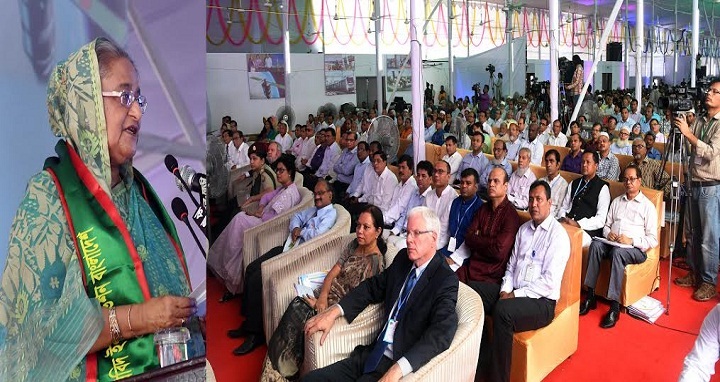 Dhaka, 8 September, Abnews: Prime Minister Sheikh Hasina today asked agriculturists to give special attentions so Bangladesh does not need to beg to others for food in future as the country became self-reliant in food. “We want Bangladesh’s march forward to continue and we don’t want to move with begging hand,” she said while opening the 6th National Convention of the Krishibid Institution Bangladesh KIB in its auditorium at Farmgate here. “We will not beg to anybody (in line with our policy) . . . So I would like to request the agriculturists to give special focus so that Bangladesh no more needs to beg to others for food,” she said.